The celebration begins, Saturday, October 30 at 1pm for Old Pasadena’s first family Halloween Celebration at Central Park. Kids are invited to join in a special Halloween pumpkin hunt. Mini pumpkins filled with candy, treats and toys will be hidden amongst fall hay, a mini graveyard and much more. Dressed up little ones can make their-own scary art project at the Armory Center for the Arts’ craft center. The festivities also include a scary animal and critter show-and-tell from the Natural Museum of History, three Halloween moon bounces, and roaming costumed characters for photo opportunities. Throughout the celebration live ghoulish music will be performed by the LA Music Academy. Come early as the first 200 in attendance will receive a free caramel apple. The fun continues, Sunday, October 31 when over 75 stores and restaurants in Old Pasadena open their doors for free store-to-store trick-or-treating. Merchants will supply a variety of festive candy and confections for all the dressed up little ghosts and goblins in attendance. Bring the little ones to the One Colorado Courtyard for free haunted professional photos against a festive background and hundreds of pumpkins. One Colorado will also host multiple screenings of Halloween cartoons throughout the evening. Guests can enjoy a unique opportunity to meet and greet with various popular Halloween costumed characters. The Old Pasadena Halloween Celebration continues into the late evening as teenagers and adults are invited to visit the Old Town Haunt, Pasadena’s award-winning scary haunted house. Descend into the darkness at the basement of the historical Union Savings Bank Building where rumor has it, mysterious occurrences have taken place in the buildings’ deadly 108 year history including reports of hideous screams, and odors of decay. Now the building is open to the public for chilling tours into the catacombs where ghosts and goblins meet from 7pm-12am. A lights-on, child friendly tour and walk-thru is also available from 12pm-4pm on Halloween day, Sunday, October 31. 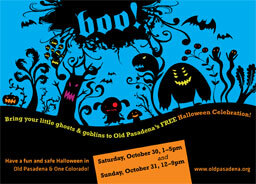 The Old Pasadena Halloween Celebration is presented by Old Pasadena Management in partnership with The Armory Center for the Arts, One Colorado and the Old Town Haunt. 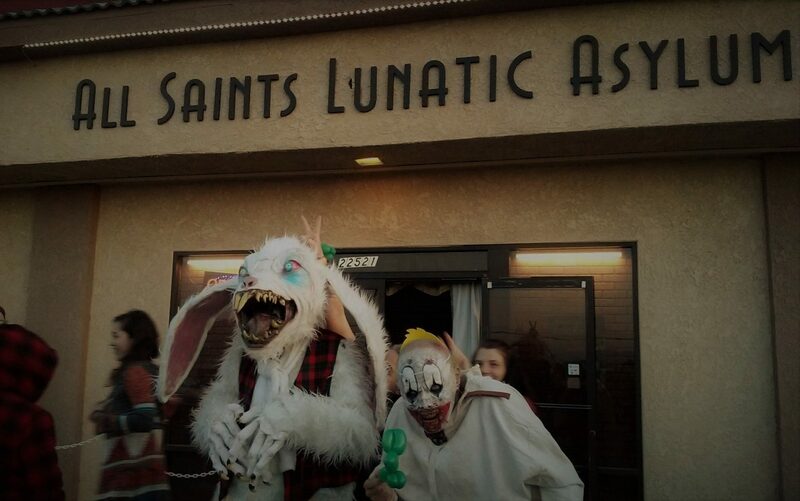 All activities are free except the Old Town Haunt which is $15 general admission. For more information on the Old Town Haunt the public can visit www.oldtownhaunt.com; for more information regarding all other Halloween activities the public is invited to call 626.356.9725.